A British woman has described how she saw her boyfriend swept to his death by a flash flood in a cave in Thailand. Helena Carroll, 21, from Solihull, clung to a rock ledge but John Cullen, 24, decided to enter the water. "He said 'I love you' and then just let go. And I didn't see him. The water was just so strong. And it was just rising and rising," Miss Carroll said. Five other tourists and two Thai guides also drowned when the cave in Khao Sok national park flooded on Saturday. 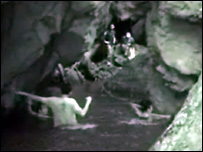 The group had been exploring the caves when heavy rainfall caused flash floods, which sent water surging into the cave. Miss Carroll said: "One minute I was in what I thought was the most beautiful place in the world. The next thing there is death all around me." She told Reuters TV the group were halfway through the cave looking at bats and spiders when water began to rush through. "My boyfriend John turned around and said we're going to die, we're going to die. And I said no, no, no. "So we climbed up on to a rock - but it wasn't high enough. "I lost my grip and I went off with the current and then I found somewhere to hold on to - and I came up and was trying to breathe because I'd been under the water so long. "And then John popped up and I was like 'You're there. Thank God you're there'. And then I kept on climbing up and John said 'I'm going to go with current'. "I said 'don't, sit here with me' and he was like 'no, no, no, no'." It was then that he let go thinking the current would take him out and he could bring help to rescue me, she said. Meanwhile, she remained in the cave for hours before rescuers eventually found her. Speaking on Thai TV station TITV, she said she was shouting 'Help me! Help me!' all night before she caught sight of a light. District official Sitichai Thaicharoen said Miss Carroll was rescued on Sunday after she was found clinging to the cave's roof. She has received treatment in a Thai hospital and is expected to return to the UK on Tuesday. The couple, both from the Midlands, were one month into a 12-month trip overseas when they were caught up in the floods. On Monday, Stephen Cullen praised his brother's "brave and courageous actions". Speaking on behalf of the family, he said John died "trying to do the right thing" and had made them very proud. John was a bright, passionate young man who embraced life and he and Helena were very much in love, he said. According to police Lieutenant Colonel Pichan Kanayasiri, the heavy rainfall caused flash floods, which sent water surging into the cave situated close to a waterfall. "The tourists were inside the cave and didn't know what was happening outside. They were trapped inside the cave," Lt Col Pichan told AFP. Among the eight dead were a 10-year-old German boy and four Swiss nationals. A senior Thai government official was due to travel to the Surat Thani province on Sunday to begin an investigation into the incident, the Bangkok Post reported. Chalermsak Wanichsombat, director-general of National Park, Wildlife and Plant Conservation Department told the paper officials at the park had warned tourists not to travel because of heavy downpours in the area.